Tails on The Trails 2009 - presented by Tails of the Tundra Siberian Husky Rescue, Inc. Spread The Word & Print It! A fun-filled day for dogs of all shapes and sizes! Come out and enjoy the day with us at Tails on the Trails 2009 from 9am to 3pm. We welcome every dog, every size, every shape to join us. There is so much to do besides hiking too: Games, food, vendors and so much more! Take A Hike, Check Out Our Foster Dogs! Leash up your dog, pack up your car and come to the park. Join us for a one- or two-mile hike in the park. Dogless people are welcome too! Hike in honor/memory of a person, pet, or as a donation. You may also choose to walk a foster dog. To learn more about hiking and how to register and our hike guidelines, please click here. The registration booth is open. Check in and/or register to hike. Don't forget to also bring your pledge collections to enter for a chance to win one our our grand prizes and also pick up your pledge incentive gifts. Check out our current foster dogs! Hikers who wish to walk one of our foster dogs must present a valid photo ID and must be 18 or older. However... dogs can be walked double lead (two leads attached to the dog, one held by an adult and one by a child.) We only have a limited number of foster dogs available to be walked - this will be on a first come first serve basis at the Foster Check out tent. We are asking for a $5.00 donation to walk one of our foster dogs. The hike kicks off at 10 am... so join us at the starting line! We will be announcing the winners of the hike pledges. There will be over $650 worth of goodies awarded to the top three pledge collectors! The grand prize winner will receive over $350 in great dog lover goodies! Stop by and meet author Kellianne Peterson and buy your "SIGNED" copy of "My Angels, My Girls". A powerful, moving, and inspirational story by author Kellianne Peterson about her three beloved dogs Georgia, Sydney and Rem-Rem. My Angels, My Girls takes us on a four-legged journey through Kellianne’s heart and home. $5 of each purchase will be donated to TOTTSHR! From funny anecdotes such as when one of her “girls” stole a pair of pliers from a visiting electrician and then hid them in a drawer to the harrowing description of how two of her “angels” helped save Kellianne by immobilizing her during a seizure, this is written by a dog lover for other kindred spirits. Her down to earth descriptions of a dog-centric life make this a pleasant page turner. Pay tribute to a beloved departed animal with one of our memory candles. Each candle is approximately 6" X 3" and includes your pets name. Your candle will look similar to the one shown in the picture. Candles will be on display at the hike and then after the hike, the candle is yours to take with you. We are accepting orders now to have the hearts prepared in advance of hike day. Cost of each memory candle is a $20.00 donation to the rescue or $25.00 if you'd like a picture added. You can reserve your candle today with paypal by clicking here. Come on out and test your paws at weight pulling courtesy of Sheryl and her two Malamutes Cinnabar and Sebastian! Sheryl is a member of the IWPA (International Weight Pull Association) as well as a member of the UKC PPAPBT Weight Pull Club, and the AMAEP (Alaskan Malamute Association of Eastern PA). Sheryl and her boys pull year round in IWPA, UKC (United Kennel Club), and AMCA (Alaskan Malamute Club of America) sanctioned weight pull events. Dog Pulling is akin to a tractor pull. Dogs compete to see who can pull the most weight 16 feet. They pull a wheeled cart on an earthen surface, or a sled on snow. The handler has no contact with the dog during the pull, so it is up to the dog's willingness to pull. Safety of the dog is of paramount concern. Since IWPA's organization in 1984, no dogs have been hurt in competition. 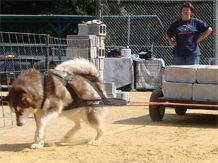 Our friends at the PA Sled Dog Club will be offering demonstrations through out the day. Learn more about this fun sport that can be a great thrill for all dogs and their owners. He will even give you an opportunity to get your dogs paws wet in mushing. Your dog can have the opportunity to get fitted in harness and hooked up to a cart for a mushing experience! Please note that dogs should be comfortable around other dogs and being handled by people to participate. If your dog loves to run, but you aren't so sure about the full mushing experience, try slipping your dog into a sled dog harness, rope him to a scooter, hop on the scooter and let him run. The dog and you become a mini mushing team! Check out the many vendors we will have at the hike this year: great food to fun sand art - below is a partial list of the vendors who will be at the hike! If you are interested in becoming a vendor, please click here for more information. Secret Spot Food Concessions: Stop and get some great food and beverages including Gelatis, Hot Sandwiches, Old Fashioned Soda's, Ice Cream and MORE! Tails of the Tundra Merchandise Booth: offering a wide variety of stuffed huskies, umbrellas, t-shirts, and other husky collectibles! Husky Essentials: offering 50 foot leashes, car harnesses, training collars, leashes, undercoat rakes, poop bag dispensers, harnesses, and skijoring/scooter/mushing equipment too. Pennsylvania Sled Dog Club: offering information about their upcoming events, merchandise to support the club and information about the sport. Arctic Star Dog Sled Company: Stop by and check out the work of sled builder Johnn Molburg. He and his family have been racing sled dogs for over 45 years. Maybe it is time for your to order your very own CUSTOMER SLED! And you can also buy some of Nancy's beautiful Needlework! Blind Dog Rescue Alliance: Welcome to Blind Dog Rescue Alliance. We are a small group of volunteers spread out throughout the United States (and even a couple in Canada!) who are dedicated to advocating for blind and visually impaired dogs by rescuing dogs in shelters, helping blind dog owners, and educating the public. Bucks County Alliance for Animal Resources: The BAAR seeks to educate the citizens of Bucks County on the care and guardianship of all animals, domestic and exotic. Creature Comfort & Care: an experienced professional pet-sitting business which has been providing service in central Bucks and Montgomery counties for over two years. DB Woodworking: Stop by and checkout the beautiful work of Joe Myers and local woodworker. Custom pieces available! Great holiday gifts or gifts for your dog sitter! Pabby's Pet Pantry: Pampering Your Pets at Practical Prices! Probiotics 4 Life: Meet Gerry Trupia, an Independent Business Owner/Distributor of Fastrack Supplements. He will be on site to answer your supplement questions. Microchip Clinic: We will be holding an AVID Microchip Clinic. Developed by a veterinarian, the AVID® microchip is safe, permanent and takes only seconds to administer. The tiny injectable "chip" contains a one-of-a-kind identification number and is recognized worldwide. A special scanner is used to read the microchip through the skin of the animal. The animal feels nothing as the chip's number quickly appears in the scanner's viewing window. Cash or check is accepted. Prices include initial registration and installation of the chip by a Vet Tech. All proceeds benefits TOTTSHR: Rates are as follows: 1 Dog - $35.00, 4 Dogs - $120.00, Over 5 Dogs - $120.00 for 1st 4 dogs and $20 for each additional dog. Foster Dog Donation Bin: We will have a foster dog donation bin set up. Help give our foster dogs a second chance. Every little thing helps... bring a box of biscuits, dog food, treats, a dog bed, towels, or click here for more ideas. We are also looking for items to be donated for our next eBay Auction.. stuffed animals, collectibles, new and slightly used items that we can sell on eBay! Dog Crate Area/ Foster Dogs: For those of you who have more than one dog.. we do have the doggie crate area. Under strict guard by several TOTTSHR volunteers, your dog(s) can have some safe down time. This is also the place to come to meet some of our foster dogs too! Doggie Pools: Don't forget to stop in at the Doggie Dip Area... come on over and take a dip at the Doggie Pools! This is where all the COOL DOGS hang out! The pups can hang out by the pools and get their paws a little wet and enjoy some husky smiles! It is sure to be a refreshing stop for your pup after their hike on the trails! Have your dog tested to be a Canine Good Citizen! Cash or check is accepted and may be paid at the CGC Booth. The purpose of the Canine Good Citizen Program is to ensure that our favorite companion, the dog, can be a respected member of the community. To receive the CGC certificate, dogs take a 10 item Canine Good Citizen Test. If you are interested in having your dog tested and want to know what is involved, please click here for more information. Check out this article about Homeowners Insurance Available to Breeds Previously Excluded with CGC Certification. We are asking for a $10.00 donation to take the CGC test. You can sign up for the Scavenger Hunt at the Registration booth. Scavenger Hunt participants will be armed with special bags to collect their eggs. Over 50 special eggs will be hidden throughout the vendor and picnic area... it will be up to you and your pup to find as many as you can! Visit vendor booths, stroll along the grass and see how many eggs you can find. Each egg will be filled with either dog treats, coupons, gift certificates and special cool dog stuff including T-Shirts! Over $50 in prizes will be hidden for participants to take a chance on wining! Redeem your prizes at the main arena! We are asking for a $5.00 donation to take part in the Scavenger Hunt. We have over 30 different items available for the silent auction. The silent auction works by simply buying your tickets, and then place them as you wish in the cup for the item you wish to win. Tickets are: $1 Each, 6 for $5, 15 for $10. Attention Dogsters: Join us in the main ring for a group photo of ALL DOGSTERS in attendance! Let's show Dogster how much we LOVE Dogster! Have you rescued a dog from Tails of the Tundra Siberian Husky Rescue or did you adopt your dog from a shelter or owner based on a referral from a TOTTSHR? Then we want to hear from you! This is your chance to let your rescued pup strut their stuff in front of all of their fans! The Alumni Revue will take place at 1:00pm at the Dog Arena. Each dog will have a moment in the "spot light" as their story is told to all of his/her fans. There is no fee to enter.. all we need is some information from you! Just click here to sign up. The Annual Pluck Off: Team up with your Husky and let's see who is the best plucker out there! You have 1 minute to just PLUCK IT! Canine Bowling: Bowling with Dogs (get your dog to knock down the pins). The dog who knocks down the pins the quickest wins! Biscuit Find: The nose knows! Which dog can find the biscuit under the cones? Fastest Ice Cream In The East: On your mark get set.. eat that Ice Cream. This year our Ice Cream eating contest is sponsored by TJ's Secret Spot! Let's see who is the Fastest Ice Cream eater In The East: On your mark get set.. eat that Ice Cream. Contest starts at approximately 2pm. Musical Sit: When the music stops the dogs all sit. Last one to be sitting... is OUT. Then, like musical chairs you learned in grade school you keep going until there's just ONE dog left! Natural Color Hike T-Shirts! ICE CREAM EATING CONTEST! The DOG Sutff PLEDGE PRIZES! Did you reserve your T-shirt yet? This year our Ice Cream eating contest is sponsored by TJ's Secret Spot! Let's see who is the Fastest Ice Cream eater In The East: On your mark get set.. eat that Ice Cream. Contest starts at approximately 2pm. If you have any questions, please contact us... call 267-566-5496 and leave a message with your name and contact information or email leew@siberescue.com.